The official music video for "Wonder Woman" is premiering now over on Parade Magazine. They call the song "...hypnotizing. The song...celebrates the strength and resilience of women through its permeating groove and catchy melodic hooks." Watch the video and read the whole article here. The third video from our new Backtracked video series is premiering now over on Atwood Magazine. 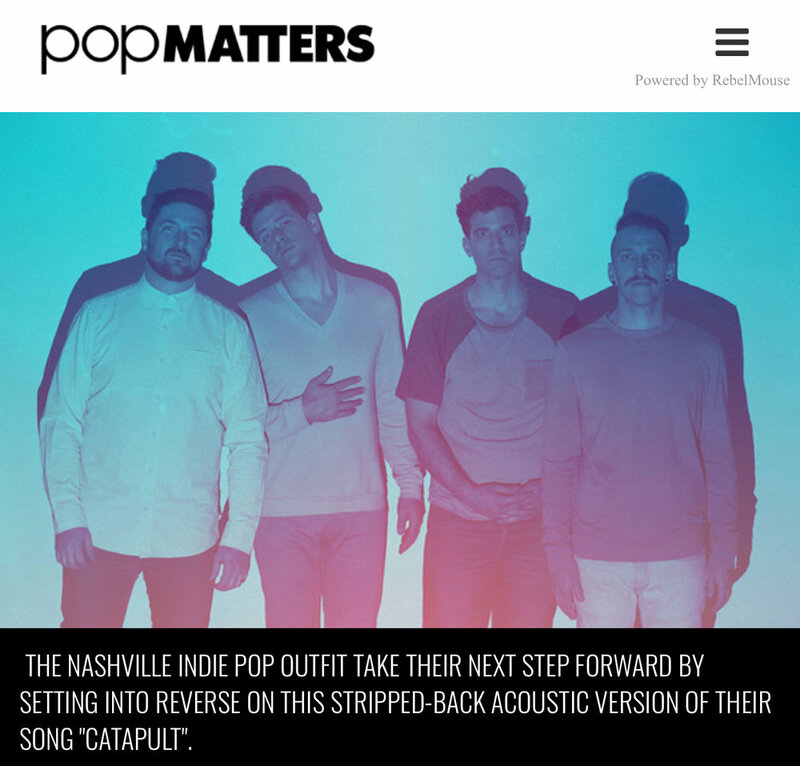 They also talked about our new Chapter One EP, calling it "...a shimmering, guitar-driven record packed with indie pop power...a euphoric expression of desire and in-the-moment connection, packed with ecstatic synths and dynamic guitars take listener and band alike to soaring heights." Check out the video and read the article here. The second video from our new Backtracked video series is premiering now over on Pancakes and Whiskey. "With just a piano, acoustic guitar, bass and a drum-track, the band fully immerses themselves into the song and the result is pure magic. While the music itself is well thought-out and has a foot-tapping melody, the real star is Daniel Ellsworth’s soaring vocals that effortlessly reach the spaces in between the bouncing notes." Check out the video and read the whole article here. We took over at Pop Dust and curated a playlist with deep cuts from some of our favorite albums, including stuff from Dr. Dog, Phoenix, Wilco, Ben Folds, Kendrick Lamar, Bjork, David Byrne, Ryan Adams, and more! Check out the playlist and the whole article here. The first video from our brand new Backtracked series is premiering now over on PopMatters. They also discuss our brand new Chapter One EP calling it "...a delectably polished dreamscape of sprightly, ebullient sound." Watch the video and read the whole article here. The official music video for "Catapult" is premiering now over on Relix Magazine. They call our brand new Chapter One EP "...a series of rich, nuanced studio recordings." Watch the video and read the whole article here. DE+TGL Play Live On "Today In Nashville"
We played our songs "Catapult" and "Control" live on WSMV's "Today In Nashville" morning show. Check out both performances here. The official music video for "Control" is premiering now over on Billboard. They call the song "...a candy-coated nugget coming straight from Nashville that sounds ready to squeeze in alongside Børns and the 1975 on your alt-pop playlists." Watch the video and read the whole article here. The official music video for "Paralyzed" is premiering now over on Paste. They call the song "...instantly, urgently current." Watch the video and read the whole article here.